I see it as a unary operator in my help. I would ask Microsoft for a patch to fix that! 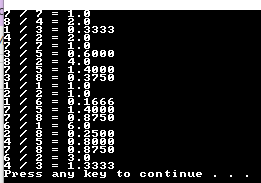 I could not find the sqrt algorithm, i was talking about above... .
2 digits groups  <- from decimal . for /F "tokens=1,2 delims=." %%a in ("%1") do set "int=%%a" & set "frac=%%b"
if %f% gtr 10 if "!block[%f%]:~1!" equ "" set "block[%f%]=!block[%f%]!0"
for /L %%i in (1,1,%addZeros%) do set "sqrt=0!sqrt!" Thanks , the algorithm is clear and if I found the source I will post. Antonio, The sqrt algorithm with many decimal is very good! I will study for increment my knowledge. The last Integer SQRT 32Bit is very fast and stable. I have try to optimize but for now is unbeatable. for /f "delims==" %%v in ('set') do set "%%v="
set  "Sqrt(N)=( M=(N),x=M/(11*1024)+40, x=(M/x+x)>>1, x=(M/x+x)>>1, x=(M/x+x)>>1, x=(M/x+x)>>1, x=(M/x+x)>>1, x+=(M-x*x)>>31 )"
rem set  "Sqrt(N)=( M=(N), guess=x=(((M-1529513880)>>31)+1)*(4096)+(((M-12752040)>>31)+1)*(8192+2048+1024+512+256+128+64+32+4+1)+(((M-29928)>>31)+1)*(512+256+128+32+4+1)+31, x=(M/x+x)>>1, x=(M/x+x)>>1, x=(M/x+x)>>1, x=(M/x+x)>>1, x+=(M-x*x)>>31 )"
rem set  "Sqrt(N)=( M=(N), x=(((M-1529513880)>>31)+1)*4096+(((M-12752040)>>31)+1)*12261+(((M-29928)>>31)+1)*933+31, x=(M/x+x)>>1, x=(M/x+x)>>1, x=(M/x+x)>>1, x=(M/x+x)>>1, x+=(M-x*x)>>31 )"
rem set  "Sqrt(N)=( M=(N), guess=x=(((M-798345024)>>31)+1)*(16384)+(((M-84015555)>>31)+1)*(8192+2048+1024+256+128+64+32+16+8+4+2+1)+(((M-5904899)>>31)+1)*(2048+1024+512+128+64+32+16+2+1)+(((M-226575)>>31)+1)*(512+256+128+64+16+8+2+1)+(((M-2915)>>31)+1)*(128+32+16+1)+15, x=(M/x+x)>>1, x=(M/x+x)>>1, x=(M/x+x)>>1, x+=(M-x*x)>>31 )"
rem i guess con intervalli sono più lenti! Rem accelerate, 1 accelerate. Se N < 715827882 posso usare la convergenza geometrica. Altrimenti uso quella lineare. set  "Sqrt(N)=( M=(N), g0=40+N/7000, q1=(0x7FFFFFFF-g0*g0*g0)/(3*g0), overflow=-(M-q1>>31), guess=x=overflow*( p=(g0*(p1=(g0*g0+3*M))/(3*g0*g0+M)) )+(2200+N/29500)*(1-overflow)+1, x1=x=(M/x+x)>>1, x=(M/x+x)>>1, x=(M/x+x)>>1, x+=(M-x*x)>>31 )"
Rem questa e' quella stabile. set  "Sqrt(N)=( M=(N), g0=40+N/7000, overflow=-(M-(0x7FFFFFFF-g0*g0*g0)/(3*g0)>>31), x=overflow*(g0*(g0*g0+3*M)/(3*g0*g0+M))+(2200+N/29500)*(1-overflow)+1, x=(M/x+x)>>1, x=(M/x+x)>>1, x=(M/x+x)>>1, x+=(M-x*x)>>31 )"
set  "Sqrt(N)=( M=(N), g0=40+N/7000, overflow=-(M-2086000>>31), x=-(M-2086000>>31)*(g0*(g0*g0+3*M)/(3*g0*g0+M))+(2200+N/29500)*(1+(M-2086000>>31))+1, x=(M/x+x)>>1, x=(M/x+x)>>1, x=(M/x+x)>>1, x+=(M-x*x)>>31 )"
set  "Sqrt(N)=( M=(N), g0=40+N/7000, x=-(M-2086000>>31)*(g0*(g0*g0+3*M)/(3*g0*g0+M))+(2200+N/29500)*(1+(M-2086000>>31))+1, x=(M/x+x)>>1, x=(M/x+x)>>1, x=(M/x+x)>>1, x+=(M-x*x)>>31 )"
set  "Sqrt(N)=( M=(N), g0=23+N/1466, q1=(0x7FFFFFFF-g0*g0*g0)/(3*g0), overflow=-(M-q1>>31), guess=x=overflow*( p=(g0*(p1=(g0*g0+3*M))/(3*g0*g0+M)) )+(((M/(2151+N/29265)+(2151+N/29265))>>1 )+1)*(1-overflow), x1=x=(M/x+x)>>1, x=(M/x+x)>>1, x+=(M-x*x)>>31 )"
set  "Sqrt(N)=( M=(N), g0=23+N/1466, x=-(M-(0x7FFFFFFF-g0*g0*g0)/(3*g0)>>31)*( p=(g0*(p1=(g0*g0+3*M))/(3*g0*g0+M)) )+(((M/(2151+N/29265)+(2151+N/29265))>>1 )+1)*(1+(M-(0x7FFFFFFF-g0*g0*g0)/(3*g0)>>31)), x=(M/x+x)>>1, x=(M/x+x)>>1, x+=(M-x*x)>>31 )"
rem echo Sqrt(%%s^)=!sqrt! - g0:!g0! q1:!q1! overflow:!overflow! p=!p! p1:!p1! guess:!guess! x1:!x1! echo Sqrt(%%s^)=!sqrt! - g0:!g0! overflow:!overflow! guess:!guess! x1:!x1! set /A "Num2=%%n*%%n, Num2M1=Num2-1, NM1=%%n-1"
for /F "tokens=1-8 delims=:.," %%a in ("!t1! :!time: =0!") do set /a "a=(((1%%e-1%%a)*60)+1%%f-1%%b)*6000+1%%g%%h-1%%c%%d, a+=(a>>31)&8640000, FPS=10000/a"
Title Time Elapsed:!a!0ms - FPS: !FPS:~0,-2!.!FPS:~-2! - Divide the interval to guess in more part. For better Guess. These work well but the performance are lower. The trick is guessing better. I have found a guess method that use LOG_x(N) (base x logarithm) but I have problem to implement. set "Sqrt1(Num)=set /A "M=(Num),sqrt=M/(11*1024)+40,sqrt=(M/sqrt+sqrt)/2"&(for /L %%i in (1,1,5) do set /A "x2=(M/sqrt+sqrt)/2"^&if ^!x2^! leq ^!sqrt^! set /A sqrt=x2)"
set "Sqrt(N)=( L=0x^!$:~-11,1^!, I=(L-1)/2, Q=(L&1)*2+((L+1)&1)*6)"
set "Sqrt1(N)=For %%$ in (^!I^!) do set /A "guess=^!q^!^!$:~0,%%$^!"" - Compact two step of newton's method into one. I have update the initial post adding other functions. Than I have edit the post number 3 for quick functions reference. set /a "x=7, y=5, C=%cmp(x,y)%"
I have not implemented the 2 parameter substitute becouse I don't know wich method is better. I have optimized the Sign(x) removing unnecessary parenthesis and adding an alternate method. if %x% lss 0 (set /A "s=-1") else if %x% gtr 0 (set /A "s=1") else set /A "s=0"   & rem 55 microsec. set "Sign(x)=(x)>>31 | -(x)>>31 & 1"     & rem 42 microsec. set "Sign(x)=(x)>>31 | -(-(x)>>31)"      & rem 42 microsec. The average execute time is show in the comment. It's calculated with an environment of standard size. Sorry to dig this up, but I've found use out of this. I was also wondering if it were possible to create a POW macro such as this? Thanks in advanced!! set /a "rnd1=!random! %% 49 + 1", "rnd2=!random! %% 49 + 1"
set /a "i=%~1 / %~2", "f=((   ((~(%~1-%~2)>>31)&1)   *   ((10000 * (%~1 - %~2)) %% ((%~2) * 10000) / %~2)   )|((~  ((~(%~1-%~2)>>31)&1)    &1)*   (((%~1) * 10000) %% ((%~2) * 10000) / %~2)   ))"
if "!f:~3!" equ "" set "f=0!f!" the pow function is reconducible to log function and exp function. Thank you so much for the resources! I will research this. for a complete add sub mul div you can view this work https://ss64.org/viewtopic.php?id=1838 I have implemented the karatsuba's multiply. How can we conjure up a a couple of math macros for this thread? These would be extremely useful! (at least to me they would be..) And I would really love to learn the math behind it if anyone could explain it or point me in the right direction to getting something like this together. I am currently working on a project of physics. Right now, all there is is a bouncing ball/vector object. It will rotate and bounce upon collision with the bottom of the screen. set /a "x=50", "y=3", "bAngle=90"
set "gravity(#)="a#+=(GRAVITY * MASS)", "v#+=a#", "a#*=0", "#+=v#""
for /l %%# in () do ( set /a "frames+=1"
( %every% 3 frames ) && set /a "!gravity(#):#=y!" set /a "lx=7 * !cos(x):x=bAngle! + x", "ly=7 * !sin(x):x=bAngle! + y"
set "ball=" & for /l %%b in (0,30,360) do ( set /a "cx=2 * !cos(x):x=%%b! + x", "cy=2 * !sin(x):x=%%b! + y"
<nul set /p "=%esc%[2J!ball!!screen!%esc%[6;6H!vy!" & set "screen="
set "SIN(x)=(a=(x * 31416 / 180)%%62832, c=(a>>31|1)*a, a-=(((c-47125)>>31)+1)*((a>>31|1)*62832)  +  (-((c-47125)>>31))*( (((c-15709)>>31)+1)*(-(a>>31|1)*31416+2*a)  ), %_SIN%) / 10000"
set "COS(x)=(a=(15708 - x * 31416 / 180)%%62832, c=(a>>31|1)*a, a-=(((c-47125)>>31)+1)*((a>>31|1)*62832)  +  (-((c-47125)>>31))*( (((c-15709)>>31)+1)*(-(a>>31|1)*31416+2*a)  ), %_SIN%) / 10000"
Overall, my goal in the end is to have all sorts of ways to interact with the ball, and it react in a "physical" way. I want to include some sort of "wind" per say. I can only imagine a cluster of invisible particles (vectors) pointing in a direction, and smashing into the "ball" object aforementioned. In my mind I imagine this would cause the ball to move as if the wind were pushing it. For this I guess I could detect collision using this macro Aacini wrote for me. This leads me to WHY I need tan() atan() and atan2(), because since each wind particle is a vector "pointing" toward a target position, I can use these functions to calculate a pointing position.